A reminder for anyone still holding tickets to anything this month by Yundi Li: In late September, his November 1 recital was officially postponed to May 20, 2010, due to an illness in the family. 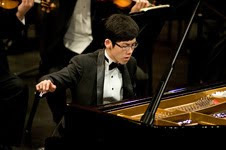 He has also withdrawn from two neighborhood events at Flushing Town Hall: A recital program on November 2 and a master class for young pianists on November 3. In the past few months, the 19-year-old Zhang has already generated more excitement than any young pianist since, well, the 18-year-old Yundi Li became the first Chinese (and the youngest) pianist ever to win the Chopin International Piano Competition in Warsaw in 2000. Bookended by those teenage gold medalists, the first decade of the millennium may well go down in history as a turning point for Chinese pianists on the world stage. In the meantime, Zhang just performed the Chopin and Liszt in recital last night at the Beijing Music Festival, and we should have a report on this blog later in the week.